This circuit, designed on request for a Halloween prop, allows fine control of a pulsing Super Bright white LED. The four potentiometers or trimmers will set precisely: on, off, ramp up and ramp down time-delays respectively. Ramp up and ramp down time-delays can be set roughly in the 1 - 15 seconds range, whereas on and off time-delays can range from a few seconds to about one minute. A 12V battery or regulated power supply is required, provided it is reasonably stable. 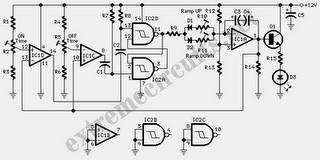 Total current drawing is about 25 - 30mA when the LED reaches maximum brightness. Wanting to use two white LEDs, the second device must be wired across the Emitter of the transistor and negative ground with its own limiting resistor wired in series, like R15 and D3 in the circuit diagram. If common red, yellow or green LEDs are required, please wire two of them in series, in order to present roughly the same voltage drop of one white or blue LED. Please note that the unused sections in both ICs must have their inputs tied to negative ground whereas the outputs must be left open, as shown at the bottom of the diagram. All time-delays can be increased by changing the value of C3 and C4 to 47µF 25V or even higher. Please vary the value of these capacitors only, as the values of the resistors wired to the four control pots are rather critical and should not be changed.